About – White Spider, Inc. Owner Erik Michael Zimmerman is a graphic artist and photographer based in Cross Junction, Virginia. Born and raised in Eastern Pennsylvania, graduated from the Art Institute of Philadelphia in 1995, and relocated to Alexandria, VA, where he started his professional career as a designer for agencies in Arlington, Washington D.C., and Leesburg, from 1995-1998. In 1998, he converted his freelance name, EZ Dezines, into a full time company designing successful projects for clients in the Northern Virginia area. In 2001, he relocated to Lake Holiday, a beautiful gated community in Cross Junction, VA, and continued to build his client list working with local companies and organizations in the Winchester/Frederick-County area. In 2007, he made the decision to change the business name to White Spider Design, Inc. – a growth change from the freelance name and personal initials, to something more iconic, edgy, and professional. In addition to graphic design, Erik also shares his passion for photography. Living and working in the beautiful Shenandoah Valley, he has enjoyed capturing and creating fine art landscape photographs. In 2009, Erik Michael Photography was developed offering his inspiring images for the home and office, and providing photography services. With the two businesses created, it was time to bring everything together. 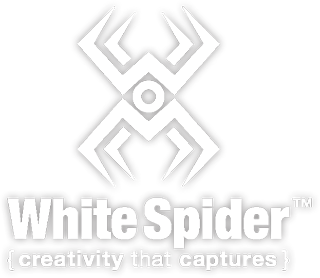 Both White Spider Design and Erik Michael Photography are now under the parent company White Spider, Inc., which was officially incorporated in 2011. Erik has plans for even more products and services to expand on the White Spider name … stay tuned for more awesomeness!